Birefractive is an A/V performance created by producer Dunmore Park (Andrew Williams) and video artist Evan Pearce, with additional assistance by Dr. Vance Williams, the Associate Chair of the Department of Chemistry at Simon Fraser University. The performance is an audio/visual journey that touches on the amazing similarity between microscopic worlds and psychedelic imagery, if viewed through the right lens. The visuals make heavy use of a technique known as polarized optical microscopy (POM) and exploits a property of many materials called birefringence. 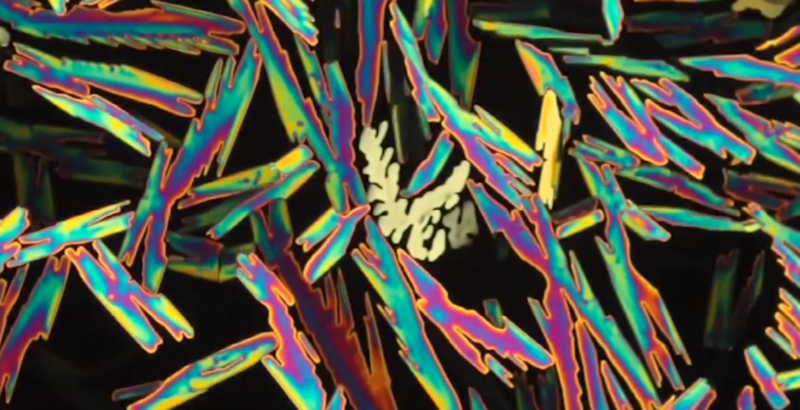 This technique allows you to see many crystals as coloured "textures" and in the case of liquid crystals, the patterns we observe help us to understand how the molecules are ordered. Incidentally, if you were to just look at most of these materials under a normal microscope, you would get boring white solids. The colours arise because of the specific ways that polarized light interacts with the material. The POM raw visuals were created by Dr. Vance Williams in the course of his research and serve as the creative inspiration for our performance. On stage, Evan Pearce, as a video artist & performer, will use the microscopic work of Dr. Williams, as the starting point for his visual synthesis. He’ll combine, layer, disassemble and reassemble the microscopic world as the music changes. The sound of the performance walks the line between electronica, techno, deep house, and ambient. 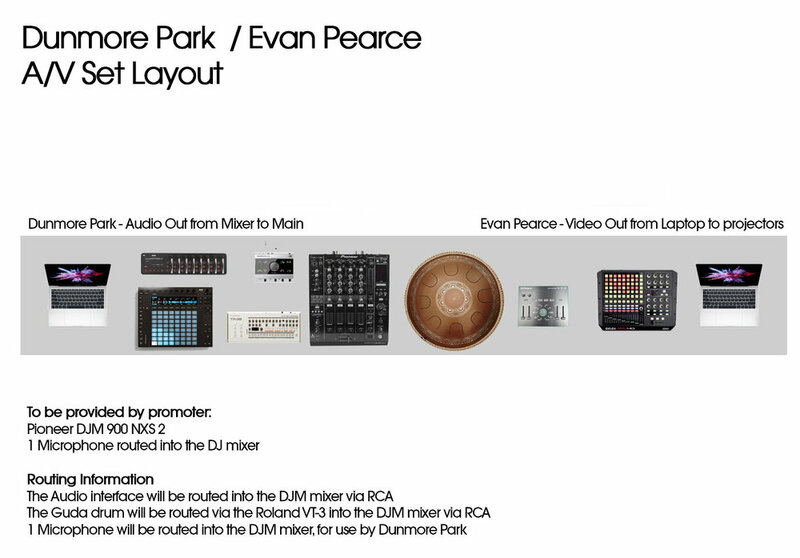 Composed and performed by Dunmore Park from a mixture of of hardware and software synthesis alongside live instrumentation (a PA enabled harmonic drum), each song is an exploration of the natural world, placed in an modern electronic context. Together, the audio and visual components will take the audience on a psychedelic journey through the microscopic world. Evan Pearce performs under Notfortheireyes, is a visual artist and VJ. Evans main focus is on abstract, experimental, video collaging. He began by editing music videos with found footage, and credits this as being the catalyst in his pursuit of visual arts. He incorporates a massive variance of content into his visual aesthetic, and mobilizes live editing and projection mapping into his VJ sets which allows him to manipulate pre existing content he’s made in that moment to create a unified atmosphere with the performers and audience. Evan has not limited himself to a certain technique. Although he started out digital and continues to excel in that format as a VJ, he has experimented with transparencies on overhead and found objects, oil projections, and video feedbacking/ synthesis. Always approaching his craft as a vessel for continual abstract expression Evan strives to learn new methods to leave the viewer feeling disturbed albeit in awe by the whole experience. Behind the decks, his innovative hybrid approach to DJing, which includes live elements like synths, guest vocalists, and live drums, takes dancers on musical journeys through house, techno, and world music. His skills behind the decks have taken him from Amsterdam to Vancouver, as well as to renowned festivals like ADE, Bass Coast, MEMETIC Festival, Taste, Astral Harvest, Motion Notion and more. I am an organic materials chemist at Simon Fraser University, where I am an Associate Professor. I did my B.Sc. and Ph.D. in Chemistry at Queen's University, in Kingston, Ontario. I did a 3-year postdoc at M.I.T. and started at SFU in 2000. Our research makes heavy use of a technique known as polarized optical microscopy (POM) and exploits a property of many materials called birefringence. 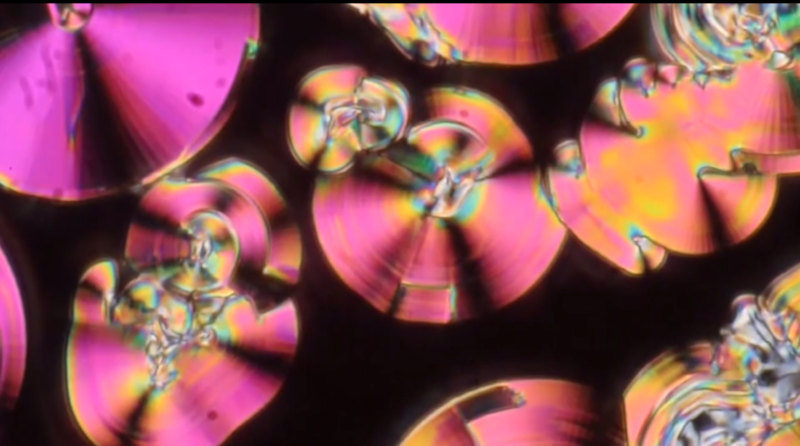 This technique allows you to see many crystals and liquid crystals as coloured "textures"; in the case of liquid crystals, the patterns we observe help us to understand how the molecules are ordered. "Normal" liquids appear black by POM, which is an effect you see in many of my videos, where there are bright droplets across a black background. The bright areas are liquid crystalline, the dark areas are the normal liquids. The two coexist at certain temperatures. Many organic compounds exhibit birefringence when they're solids; this is why I have lots of pictures of things like vanillin (from vanilla), menthol (from mint), and thymol (the scent molecule for thyme), which all show nice images. Incidentally, if you were to just look at most of these materials under a normal microscope, you would get boring white solids. The colours arise because of the specific ways that polarized light interacts with the material. A way you can see this is too look at a piece of hard plastic (e.g. a ruler) while wearing polarized sunglasses. You'll often see rainbow patterns in the plastic, especially where it has been stressed by bending it. This is because stressing the plastic makes the material birefringent in that area; this is also how glassblowers test for stress when making glass (there's a video of this on my feed).